Pictured at the Dinner. 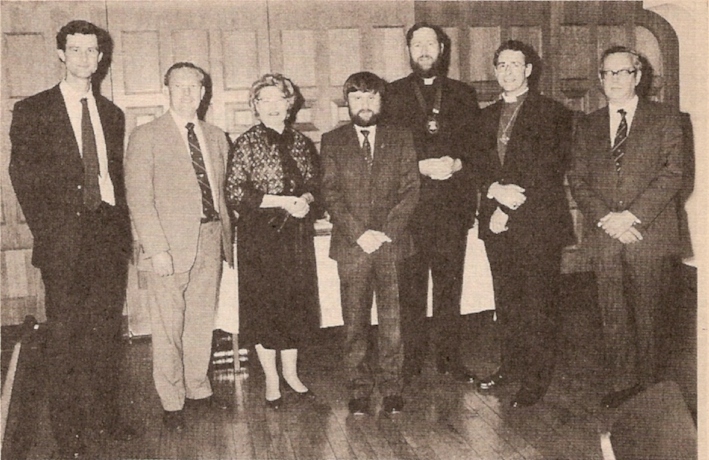 Left to right: The Reverend William S. Croft, Roger Savory (Past Master), Gilian Davis (Past Master), John Colliss (Past Treasurer), the Reverend Barry J. Fry (Master), the Right Reverend Timothy J. Bavin, Bishop of Portsmouth (President), Derek Jackson (Secretary). Photograph courtesy The Hampshire Chronicle. The Winchester and Portsmouth Diocesan Guild held their 18th Annual Dinner on 25th April in Winchester Guildhall with the King Charles Suite providing a very stately background for a gathering of 89 ringers and friends. The Master of the Guild, the Reverend Barry J. Fry, extended a welcome to all present, particularly the guest speaker, The Right Reverend Timothy J. Bavin, Bishop of Portsmouth, who is also a President of the Guild. In his speech the Bishop gently chastised the ringers for inviting him to spoil the dinner and he thought himself mad to accept! Seriously, it gave him a chance to express his appreciation of the service ringers give to the church although they make more noise than anyone else. He said bells had had quite an influence on his life; he had heard the curfew bell at Windsor, bells at school, goat-bells when in the army at Aden. He had learnt to handle a bell while at college, went to South Africa. He returned to become a curate at Uckfield where he tried ringing again but, although he did no damage to the bells, he was not invited to continue! Returning to South Africa again, eventually becoming Bishop of Johannesburg he was invited to be President of the Transvaal Society and during this time the ring of bells was installed at Parktown. Two years ago he returned to become Bishop of Portsmouth. In his reply to the Bishop, Mr. A. P. (Tony) Smith, said that the Guild had not had a ringing president before or one who had had a bell named after him - the tenor "Timothy" at Parktown. Mr. R. Mark Esbester spoke on behalf of the visitors. He welcomed Mr. Bert Luck, a past chairman of the Kent County Association; Mr. Tom Chapman who used to ring at Bishopstoke and past Master Mr. Roger Savory who now lives in America. The Reverend W. S. (Bill) Croft replied on behalf of the visitors. Although he now lives in Chichester he knew the towers and ringers of the Guild very well so took delight in giving a sideways glance at people and towers of the area. The rapid tour started at Botley with a 3-bell peal; on to Liss where there is no by-pass; a reference to a 9-bell peal at Basingstoke and a glance at the impish Charles Kippin; Fawley oil refinery and refinery of ringers - Roger Savory; Brockenhurst's augmentation to eight tiny bells; a quick mention of Bournemouth. He then moved to the far north to a strange phenomenon called Dodd - either "The" or "A" Dodd but he was known to be alright. (Geoff was not present because of an important peal at Southwark). Before homing in on Winchester he called at Bishopstoke to consider the creation of a primate's office for Roy and John. At Winchester Cathedral he recalled a cupboard into which men sheepishly disappeared occasionally. He concluded by wishing the Guild well. The Master thanked Elizabeth Chapman for her work as convenor of the Social Committee and made a presentation to her in recognition of her work over the past years.